In the last Olympic Games in Rio de Janeiro, the usual suspects made it to the men’s 4x100m relay final. As you might remember, Jamaica, led by Usain Bolt, won the gold medal, admittedly not a big surprise. A tough question, however, is who won the silver medal. If you are not much into athletics, your educated guess might be either US or Canada, indeed former winners, but actually the second place was to… Japan! The fact the Japan was second only after Jamaica is surprising mainly because none of the four athletes that make up the Japanese team are specially fast (in relative terms of course) at running the 100m race. The table below shows, for the five best teams in Rio, the names of the team members together with their best personal marks in the 100m race. As you can observe, not a single Japanese is below 10 seconds, in contrast to all other teams. Source: own elaboration based on data from Wikipedia. To get a better perspective of how outstanding Japan’s performance was, we can represent some of the figures in the table above pictorially. Th graph represents, for each team, the sum of the best individual marks of the team members (in green) together with the total time at the 4x100m relay in Rio (in blue). Common sense suggests that, roughly speaking, the teams with the best performers at the 100m race, should also perform better at the 4x100m relay. And as you can observe, that is actually the case for all teams in the graph, except for Japan. In fact, Japan should have been fourth or fifth. Not only Japan was second, but they were faster than the US by more than a second, a lifetime when it comes to the 4x100m relay. How did Japan achieve such an outstanding performance? Well, the truth is that the Japanese were extremely good at passing on the baton. They admitted having trained and trained for months to achieve this superior performance at handing over the baton. On average, they reduced each transition by some 30 or 35 hundredths with respect to the other teams. It doesn’t seem much, but, overall, that is 3 changes times 35 hundredths, or roughly one second, that is, a 2.5% reduction in a 40-second race. Their smart strategy really paid off! However, the strategy is not new: Japan and, in particular, Toyota, pioneered in the 50’s the dramatic reduction of set-up time as a sensational way to increase performance, and has proven so by showing the world how to manufacture cars faster, cheaper, and better than competitors. The relevant point in the olympics example is that learnings and insights from the manufacturing world (such as the benefits of reducing set-up time) can be extrapolated to other environments (such as service operations) or even the non-business world. This example should open the door for similar initiatives in many other settings. Last month I flew from Madrid to Mexico City to participate as a speaker in the 2015 logistics summit. 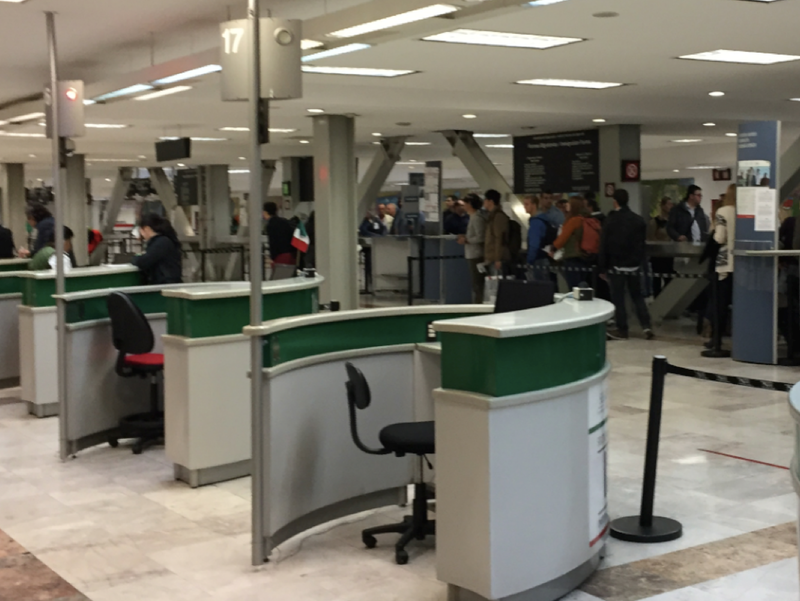 When I got to the customs area at the airport in Mexico City I had to wait some 45 minutes to clear customs. Admittedly, after a 12-hour flight, the last thing you want to do at the airport is to waste almost one hour doing nothing but keeping the line. So I decided to try to do something productive while waiting, and so I had a quick look at how operations are organized at the border facilities. 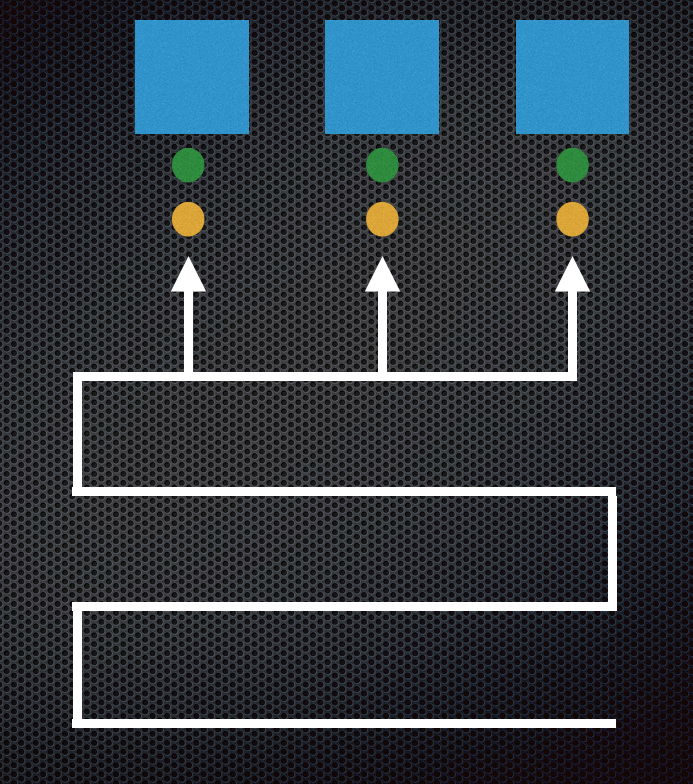 Any Operations 101 course tells you to look for the bottleneck of the system first. That was easy, there was plenty of space, desks (around 20), but not enough officers, as you can see in the picture below. This makes sense, as police officers are by far the most precious resources at the border. Of course, there were enough officers to cope with average passenger demand during the day, but given the huge variability of arrivals (in the form of large waves when international flights arrive), passengers in the line is the main buffer against demand variability, which leads to long waiting times. The next step was to remember two simple rules to manage bottlenecks, namely 1) the quality of input must be guaranteed, and 2) the bottleneck input buffer must be full at all times. There is where I saw two interesting opportunities to improve. In the case of quality of input, I observed that some passengers had not filled their customs forms, or, even if they had done so, they had not filled all the mandatory fields. Therefore, they had to do so while at the bottleneck, that is, when the officer told them to do so. That was time consuming (what was the code of my flight?) for both, the passenger and, more important, the officer. This is in contrast to customs in other airports, where non skilled workers filter out incorrect forms before passengers get to the bottleneck. As for the input being full at all times, note in the picture above that the lady next to the officer has no other passenger/s right behind her. That means that when an officer finishes serving a passenger, the first passenger in the line (the girl in the light grey jumper in the picture) has to identify which officer is idle and go there to be “processed”. But passengers are not very agile at doing so, especially after a 12-hour flight. Therefore it was common to see officers waiving hands at passengers or even shouting things like “Next passenger please”. I measured “set-up time”, that is to say, how much time it took for passengers to go from the beginning of the line to the officer desks: 9 seconds on average. I also measured “service time”, how long it took officers to do their job once the passenger was at the desk: 40 seconds on average. 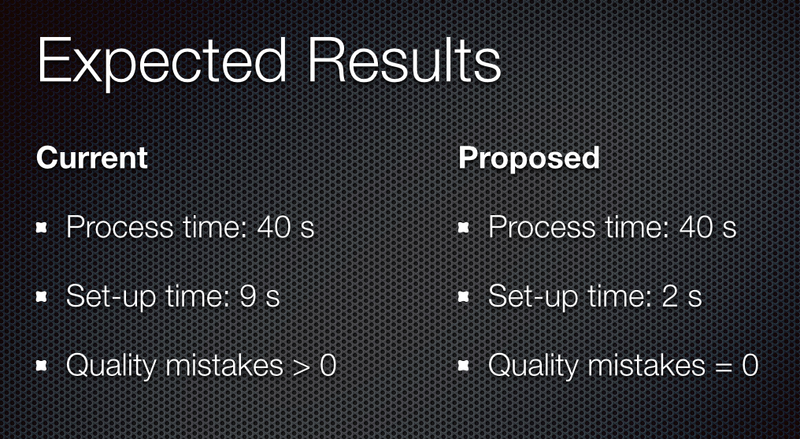 The comparison of he two times struck me as surprising: 22% additional time because of set-up time! That reminded me of another mantra of operations: “reduce set-up time”. How to do that in this case? A simple way to do it is to add a 1-person or a 2-person buffer right after the person being served. 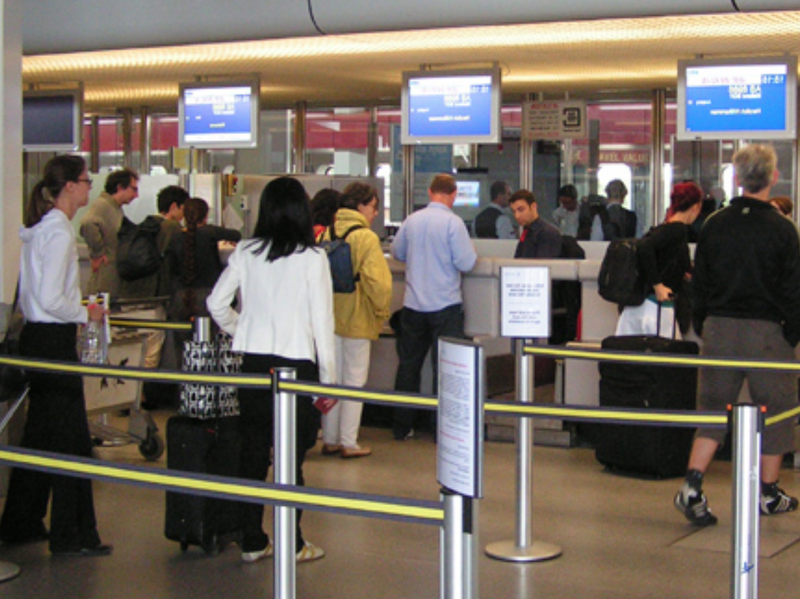 This is common in many airport lines, as shown in the picture below (see, e.g., the guy in the yellow jacket). But it is notable to me is the fact that that simple modification would reduce those 9 seconds of set-up time to only 2 (I guesstimated this figure). What would be the impact of this set-up reduction in officers productivity? Some simple calculations lead to a surprising 18% increase in productivity, from current 73 to expected 86 passengers per hour and officer. Combined this with the first change suggested, and you can expect productivity to boost by more than 20% at a very low or even no cost. This example illustrates how the usual production techniques can be implemented into service environments, where there is a tremendous opportunity for improvement, mainly because managers in service operations have not realized yet about how much money they are leaving on the table. It also gives some evidence of how easily operations in a service environment can be observed and improved. In this case, 45 minutes of casual analysis may lead to significant annual savings for the same waiting time, or, even better (at least for passengers), dramatically reducing waiting unproductive time to cross the border. En marzo de 2015 participo como ponente en la Logistics Summit de Mexico DF. El objetivo de la ponencia es entender cómo podemos crear valor desde la cadena de suministro y conocer cuál es el impacto de las decisiones operativas en la parte financiera de la empresa. Aquí dejo un enlace a un vídeo de 90 segundos donde doy algunos detalles más. ¡Nos vemos en el DF! Hace un tiempo escuché a quien por entonces era vicepresidente de supply chain de la multinacional química Solutia, Roger Bloemen, comentar un par de ideas que me resultaron chocantes y provocaron mi reflexión. Echando un vistazo a ambas expresiones cuidadosamente, puede apreciarse que el paralelismo entre los dos mundos, operativo y contable, es total. La segunda idea del sr. Bloemen que me resultó llamativa fue “si no entiendes el impacto de tus decisiones operativas en el triángulo, no puedes ser un profesional de la cadena de suministro“. ¿De qué triángulo estaba hablando? Se refería sencillamente al formado por los tres estados contables más importantes, a saber, el balance, la cuenta de resultados y el estado de flujos de efectivo (cash flows), representados en una figura como la siguiente. En este sentido, mi experiencia es que los directivos de operaciones y de logística miden el éxito de sus decisiones en función de su impacto únicamente en la cuenta de resultados (antes de impuestos, por cierto), es decir, se preocupan únicamente por uno de los vértices del triángulo. Por ejemplo, un directivo de compras puede decidir comprar en un país de bajo coste, digamos en Asia, porque aspira básicamente a conseguir que su proveedor rebaje el precio de la mercancía, lo que tiene un impacto medible y contundente en el coste de las ventas y, por ende, en la bottom line de la cuenta de resultados. 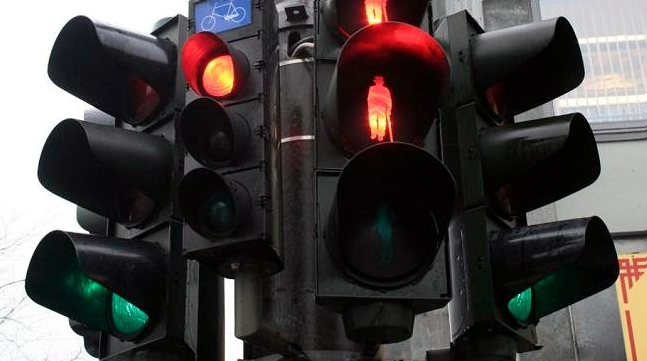 Este objetivo, siendo loable, hace caso omiso de los otros dos vértices del triángulo. En concreto, ¿qué sucede en esos vértices si el proveedor está ahora a muchos miles de kilómetros de la demanda? Una consecuencia inmediata es que el tiempo de respuesta (lead-time) del nuevo proveedor crece de forma desorbitada. Esto implica aumentar los inventarios en tránsito (producto en la bodega de un barco) y de seguridad (necesario para lidiar con las fluctuaciones de demanda) de forma muy significativa. Este inventario nuevo tiene un impacto grande y real, tanto en el balance como en los flujos de efectivo. ¿Se evalúa al directivo de compras en función del impacto en el balance y los flujos de efectivo? Claramente no, y sin embargo sabemos que un exceso de inventario tiene poder para llevar a una empresa mediana incluso a la suspensión de pagos. En el centro de esta discusión se encuentra una variable clave, las necesidades operativas de fondos (NOF), también llamadas requerimientos de capital de trabajo (WCR, por sus siglas en inglés). El nivel de NOF y sus cambios tienen un impacto capital en el balance y el estado de flujos de efectivo de cualquier empresa que posee inventarios. Entender cómo y cuánto cambian las NOF es esencial para comprender cuál es el impacto de las decisiones operativas no solo en el triángulo, sino también en el riesgo de la compañía, sus ratios financieros y, en definitiva, la creación de valor para los accionistas. Dadas estas reflexiones, se hace patente que hay una carencia formativa importantísima para los directivos del ámbito de las operaciones, que sólo puede mitigarse mediante un entrenamiento adecuado. Aquellos directivos que sean capaces de manejarse con soltura en el ámbito financiero y entiendan el impacto de sus decisiones en la parte financiera de la empresa conferirán a ésta una ventaja competitiva de primer orden y se harán indispensables en sus organizaciones como impulsores del cambio para llegar a la excelencia operativa. In his book “Making learning whole”, David Perkins talks about two widespread diseases of the educational system, namely “elementitis” and “aboutitis”. Elementitis has to do with learning the elements of a discipline without seeing the big picture. Elementitis prevents students from understanding what is the purpose of the topic considered, rising their levels of frustration, apathy, and boredom. This disease is widely spread across the world when it comes to learning some important subjects, such as math. Students spend literally years learning topics in algebra, calculus, or statistics without immediately seeing their application. Imagine a cooking school where cooks-to-be learn how to bake doughs for years without even mention the word “pie”. It would be non-sense. But that is exactly what occurs in the math realm. High school students learn how to multiply or invert matrices, but they have no idea what matrices are for. When teaching foreign languages, some schools start teaching the elements of writing, grammar, and even style, without really practising oral skills. What is the point of doing this? I have seen hundreds of students able to understand something written in a foreign language, but totally incapable to actually speak more than a few sentences in such a language. My favourite example is how some teachers make (or pretend to make) their students learn English irregular verbs. Students have to learn by heart an endless list of verbs with three columns, such as eat-ate-eaten. Can there be a worse way to teach irregular verbs? This awful method is also applied to phrasal verbs, vocabulary, and so on. Unfortunately, math and languages are not the only examples of subjects infected with elementitis. History, chemistry, physics, or literature, to name a few more, could have been used as examples as well. At the opposite end of the spectrum, programming applications such a Scratch from MIT give immediate feedback to programmers and a rewarding sense of utility. It is not a coincidence that Scratch has become so popular among young students. 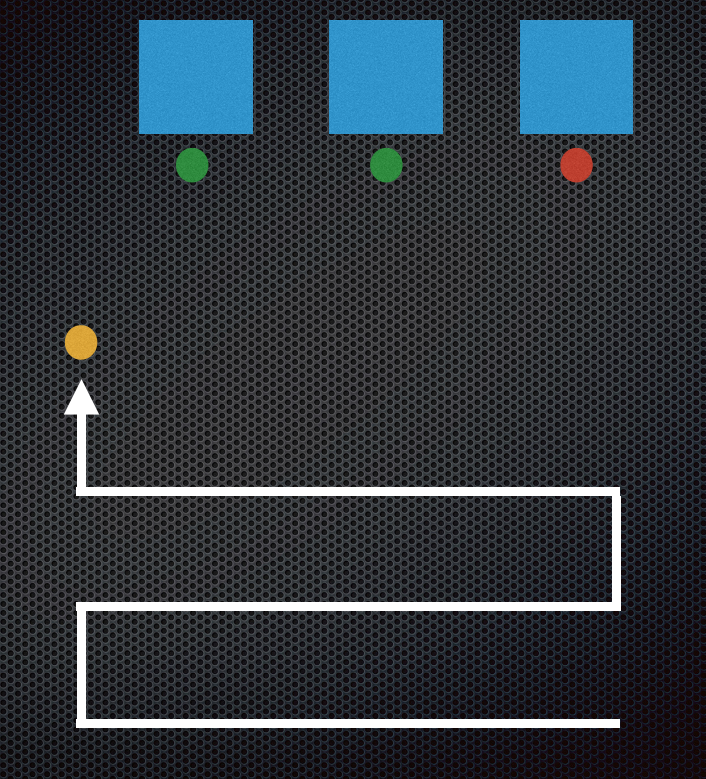 Scratch philosophy is in line with Perkins’ recommendation to avoid elementitis, namely start by playing a simple version of the whole game from the very beginning. As mentioned, this is easier said than done, but the point is there: innovation is needed to extrapolate the philosophy of Scratch to other spheres. 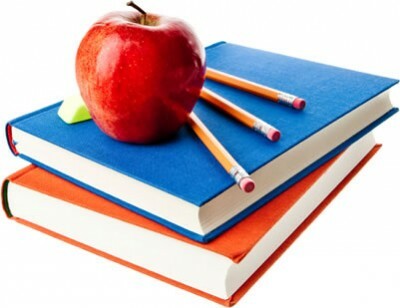 Aboutitis is related to the inability of students to learn a specific subject in full. There are so many subjects to learn and time is so limited, that teachers cannot go deep into any subject, they content themselves with scratching the surface. As a result, students are able to recognize the topics (“I have seen this before”, “that rings a bell”) but have not really grasped the rewarding deep insights that were awaiting them one or two steps further. Aboutitis prevents students from continuing learning on their own based on the knowledge acquired in the classroom. The building blocks on which their knowledge is based are not solid, but slippery. Sadly enough, aboutitis leads to covering the same topics again and again year after year at school, which again entails ample boredom and frustration. From my own experience, I can tell that my children, when learning English as a foreign language, have “learnt” the difference between present simple and present continuous for seven or eight consecutive years each. Being aware of the existence of the two diseases, elementitis and aboutitis, is the first step to coming up with new, disruptive ways of teaching and learning. This transformation should occur at two levels. First, teachers in the classroom should try to teach fewer topics better and give an immediate sense of usefulness trough simple examples or experiences. Second, when designing an educational path, the whole body of knowledge to be taught should be split differently and coordinated in such a way that these two diseases are avoided. As I said, easier said than done, but for sure it is worth trying. Perkins, D. “Making learning whole. How seven principles of teaching can transform education” Jossey-Bass, 2009, San Francisco, CA.